but one, and mount a special repeating trap on that hole. 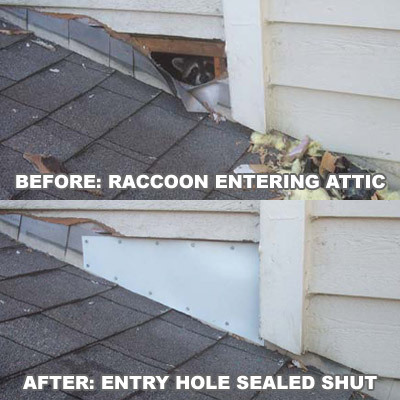 Wildlife control in homes and attics simply can't be done without sealing the entry points. When we perform a full inspection of your house and roof, we will let you know exactly what needs fixing, and give you a firm price quote to get it taken care of, correctly, the first time. Rat and squirrel prevention for your home - The best rodent prevention at your home is to make sure your home’s defenses are adequate. This doesn’t mean installing a perimeter fence or buying a tiger to patrol the yard. Rat and squirrel defense is as simple as making sure your home is in good enough to condition to fend off a rodent attack. Homes that are damaged are particularly susceptible to rat infestations. Rat prevention means going around your home at each level and filling in holes that may become rat doorways. Home maintenance extends into the yard. Rats like to be under cover; they are prey animals. By keeping your grass cut short and your vegetation away from the ground, rats will have very little camouflage as they try to sneak toward your home. A rodent that has to run through an open area will be less inclined to linger there for long. Aside from home repair, there are no repellents on the market that can be relied on. Home remedies are just as ineffective. Your property needs to be well-kept, and your garbage needs to be put away or sealed tight. You cannot rid the outside world of rats, but you can prevent rats from ever becoming an issue at your home.